Extracts and follows a link matching a dynamic definition. This option should be used when a scenario includes a click on a dynamically-generated link. 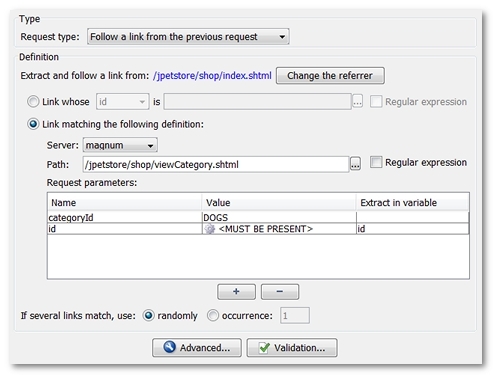 The link from the results of the preceding request (referrer) are dynamically extracted and followed. The referrer may be changed by clicking on Change the referrer; note that the referrer must always be located earlier in the scenario than the current request. When defining the link to be extracted, you may specify the HTML attributes of the link to be followed (name, id, link text, alt), or define all the link elements (URL, parameters). A typical case is where one or more of the link parameters are dynamic. Where several links in the server response match the definition, the last option in the panel allows extracting a link randomly or specifying the occurrence to be extracted.